Some time ago, I did a session at Direction EMEA in Berlin. Apparently, some people were inspired with this. Not only did I introduce "cannibalism" (never expected this to be something "hot, new and inspiring" but rather something "obvious" - let's spend a blogpost on that as well.. :) ), but also I showed an example of consuming a third party web service. And some time ago (quite some time, actually), I promised one of the attendees to blog about the VAT example I showed there. In fact, you can see this as "consuming a third party web service". There are tons of those out there .. and this example is quite useful, if you ask me (more useful than getting the weather info, or a list of songs of a certain genre, is it.. ;°) ). 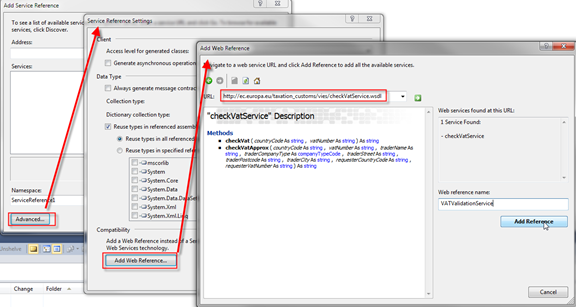 Basically, using this web service, is kind of the same way as using any web service - so also quite the same as I described in this blogpost: NAV 2009 R2 .Net Interop: Calling a Web Service (come to think of it - I can make this blog quite short and let's share the objects I created here). This will take the majority of your time - at least 2 minutes (because Visual Studio doesn't load very fast). I'm not going to create a service reference, but a web reference. That's it, people! 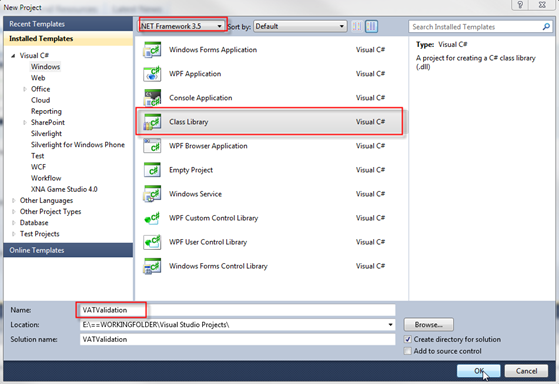 Build you're solution and get the hell out of Visual Studio! (in my case, the server is running on my laptop, but obviously, you should put the dll wherever it will be used - NST, failover, ...). In this case, my NST will be executing the business logic, so I don't have to put it client-side. Let's go to nav and write some very simple code there - it's not functional in any way, it's just a test-codeunit that uses the service. You can build the business logic any way you like. I agree, the business logic is not useable at all .. but that was not the intention. I just provided you the way to use the CheckVat function .. and now it's up to you. The download contains my test-objects from my demo-db. Take them "as is" .. so if you want to implement this at a customer, do that on your own risk - and reconsider the code (make it "partner ready" :-) ). The RTC codeunit. You'll have to provide an action on some page to be able to run it. A classic codeunit. Did't mention it above, but this is code what it would look like in the classic environment. It also works .. but who wants to write that? :-) It's just there for your reference/comparison. That might explain my own problems sometimes when I'm unable to connect to the service.. :-). eg. my own country, Denmark, have an instable server sadly. We use this Web Service (not in Navision) for quite a time now. If you can't reach the web service for some reason the result is not valid - although the VAT No. might be correct. You will definetly have to deal with that.